Barcelona is an excellent city with a great cultural, gastronomic, musical offer … An active city in constant movement with large events and congresses. 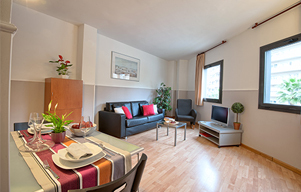 If you have decided to visit Barcelona and spend a few days for sightseeing, for leisure, for a concert or for work, in Apartamentos Sata we have a wide range of apartments for short stay, which are adapted to each of our guests’ needs. 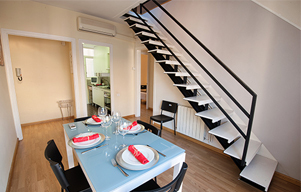 The location of these apartments for days is unbeatable, allows you to be close to the main points of interest without losing the essence and tranquility of a Barcelona neighborhood such as Gracia Nova, Sant Gervasi or the Olympic Village. 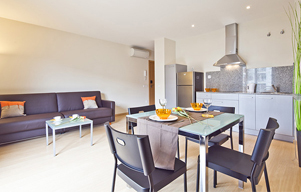 The communication with public transport allows those who stay at Apartamentos Sata to be in the center of the city in 10 minutes and move around Barcelona with agility. Do not hesitate to consult our apartments if you want to know more.